We have been working with the hotel to flesh out the details of the hotel room booking procedure for this year. No doubt you are very curious, so here is how it all will work. The room rates are the same as last year for all categories! Just as in previous years, the nightly rate is per room, not per person, and it still includes breakfast, service, VAT, and the Berlin City Tax. When your Eurofurence registration has been manually accepted by us, you will be able to log in to the registration system and navigate to "How to Book a Room" in the green menu sidebar on the left. Please read the page that opens when you click on that link. The app will help you compose a standardized email, including a personalized code, which you will then have to send to the hotel. 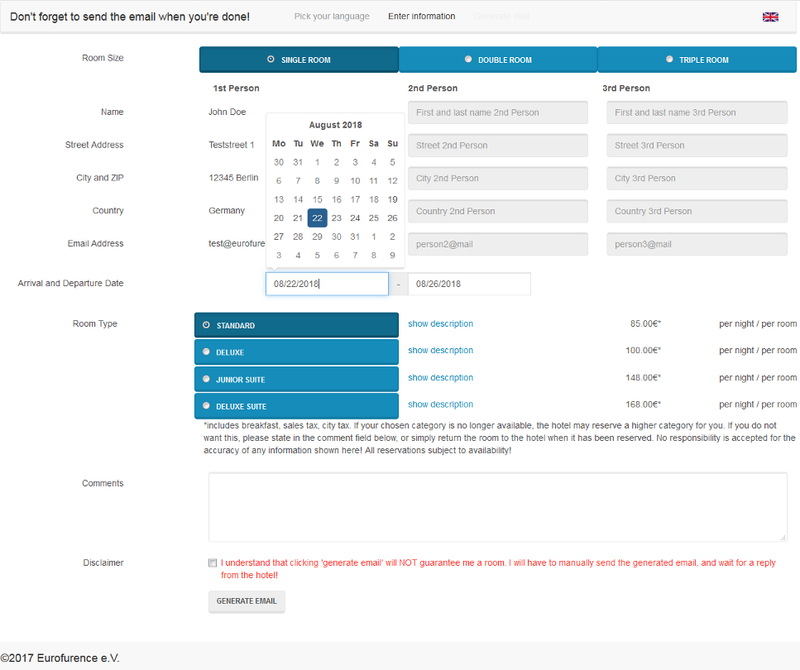 Step 2: Select a room size, fill in the information for any of your roommates (can be left blank if you do not have one yet), and pick your arrival and departure date. 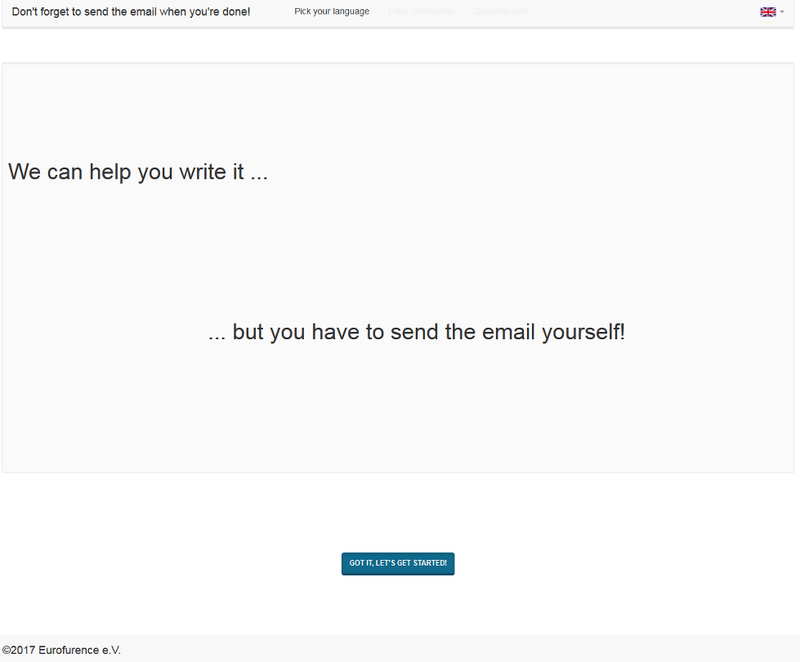 Finally, tick the checkbox and click "Generate Email". Just in case, the generated email is also written out, so you can always copy&paste it into your email program instead. Now all you have to do is actually send it. You will only be able to reserve one room using your personalized code, and you need to be staying in it, that is why the app won't let you change the info for the first person in the room. When you have sent the email, the Estrel will write back to you when it's your turn in the queue and either confirm your reservation or tell you what your status is. Note that if your chosen category has become unavailable, the hotel will automatically book the next available higher category. If you do not want this, simply reply to the booking confirmation mail to cancel should this occur, or state your preference in the comments field of the web application. Once you have sent the inquiry to the hotel, the hotel becomes your sole point of contact regarding your reservation! Eurofurence is not involved in the transaction. Any changes you need to make regarding your booking you will need to address to the hotel per mail. Note that you cannot transfer your room to someone else, you will always have to be the first person in the room. You can however cancel your room altogether, up to the cancellation deadline which the hotel will tell you when confirming your reservation. In this case, the hotel will reassign the room to the next person on the waiting list. You have no say in who gets the room! There is a maximum of three people to a room, but this is subject to availability of additional roll-in beds. You may not bring your own additional sleeping arrangement such as air-mattresses etc. If availability runs out, the hotel will book a two-person room for you. Can I phone the hotel? Will doing so allow me to skip the queue? During the initial rush please be patient while your email is being processed. Note that you cannot make a reservation by phone. I'm the second person in a room. What do I need to do? Assuming that the first person in your room is handling the reservation, you don't need to do anything. Any reservation at the Estrel is for a complete room, not for a single bed, so you do NOT need to also go through the process, or you might end up with two separate rooms in the end. We don't know yet how the hotel is going to handle this situation, we'll ask them and post their answer here. If you have further questions about this procedure, the thread at https://forum.eurofurence.org/index.php/topic,7918.0.html is a good place to ask them.